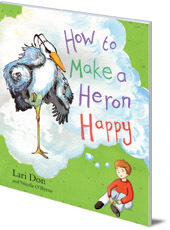 A delightful story from popular children's author and storyteller, Lari Don, is brought to life with vibrant illustrations. Colour and activity build up as the book progresses and the drab inner-city park is brought to life. The heron in Hamish's park always looks sad and grumpy. Hamish tries lots of ways to cheer it up: will the heron ever be happy? Colour and activity build up as the book progresses and the drab inner-city park is brought to life. Hamish is worried about the heron in the park. It always looks sad and grumpy, with its hunched-up shoulders and long frowning eyebrows. So Hamish decides to cheer it up: first he brings bread crusts and biscuit crumbs to the park. But the heron still looks grumpy. Next he brings his family to tidy up the heron's polluted pond. But the heron still looks grumpy. Then he brings his class to plant flowers around the pond. But the heron still looks grumpy. Finally he brings everyone he knows to have a party for the heron. But the heron still looks grumpy. Hamish looks at the heron and wonders: maybe the heron isn't unhappy after all? Each page of this delightful story from popular children's author and storyteller, Lari Don, is brought to life with vibrant illustrations. Colour and activity build up as the book progresses and the drab inner-city park is brought to life. Lari Don has worked in politics and broadcasting, but is now a full-time writer and storyteller. She grew up in the north-east of Scotland, and lives in Edinburgh. She is the author of three other picture books for young children,The Big Bottom Hunt, Orange Juice Peas and The Magic Word, as well as novels for older children including First Aid for Fairies and Other Fabled Beasts; Wolf Notes and Other Musical Mishaps; Storm Singing and Other Tangled Tasks; Maze Running and other Magical Missions; and Rocking Horse War (all Floris Books). Nicola O’Byrne was born in Swaziland and has lived in Papua New Guinea, Singapore, Kenya and Edinburgh. She studied illustration at Edinburgh College of Art and is now in London working towards a Masters in printmaking. She bases her illustrations on real observations and can usually be found in a bookstore or a coffee shop drawing the people around her. Through her research for this book she can confirm that herons always look grumpy! It's storytime as Lari Don reads her picture book Orange Juice Peas. Watch out for the pea flicking at the end! 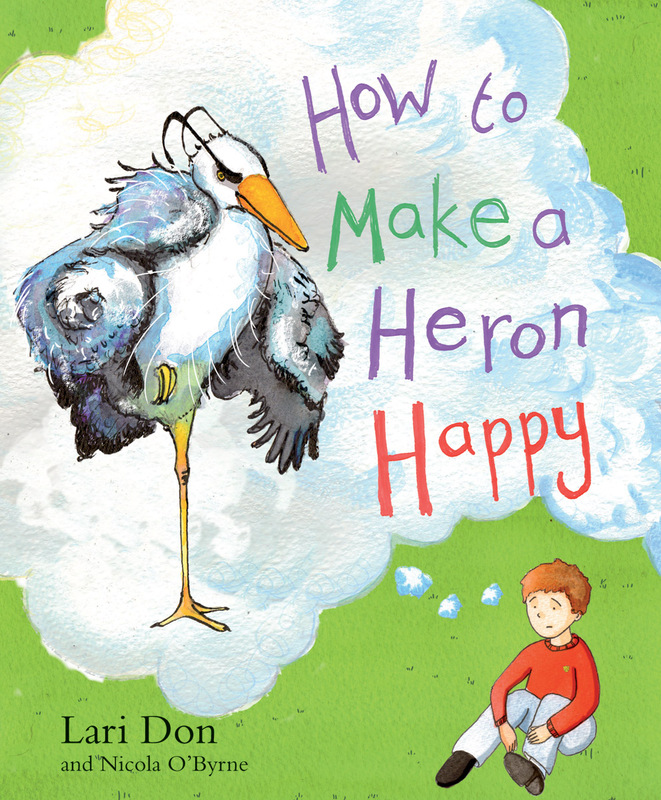 How to Make a Heron Happy is in Floris Books' range of Picture Kelpie Scottish children's picture books. Parents of young children might also enjoy the dedicated Picture Kelpies website. Download and print out games, colouring and jokes for your children based on Picture Kelpie favourites, and find out more about these quality Scottish picture books to enjoy together.